Taking afternoon tea at the Cupcake Cafe is sure to delight anyone with a sweet tooth. 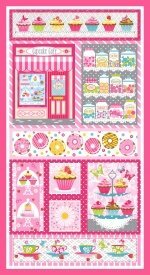 Cupcakes, candies and all kinds of sweet treats are the themes of Laura’s first line for Studio e Fabrics. This collection has a 24” panel and a range of coordinates in sugary frosting colors. Jars of candy, fancy cakes and cake stands all add to its sweet delight.